The Cleveland Browns will work out Joel Bitonio at left tackle in training camp. BEREA, Ohio -- Well, it is on to “Plan Z” for the Cleveland Browns. Over the weekend, Browns offensive line coach Bob Wylie said moving left guard Joel Bitonio to left tackle would be “Plan Z,” but head coach Hue Jackson is confident Bitonio can handle the transition and lined up the interior blocker on the edge during the sixth practice of training camp at the team’s Berea headquarters. During the offseason workouts in the spring, Bitonio “took a couple reps” at left tackle, but primarily occupied the left guard spot through the first five days of training camp. However, all of that changed by the time Wednesday’s workouts started. “I know we have a few guys that haven’t been able to practice, like (Greg) Robinson and Desmond Harrison, that I know they’re high on,” Bitonio said. “They want to give them a chance at left tackle, and whatever helps the team win. When the Browns selected Bitonio with a second-round pick in the 2014 NFL Draft out of the University of Nevada, they liked the fact that he was a versatile offensive lineman, who played 26 games at right tackle and his final 12 contests at left tackle. During his final two seasons at Nevada, Bitonio recorded 249 knockdowns/key blocks, which averaged out to 9.96 per game, and served as a lead blocker for 58 plays that resulted in touchdowns, 41 of which were rushing scores. Last week, Bitonio stated that if he was asked to switch back to left tackle, he would like “a few weeks hopefully” to work at the position, and he will have plenty of time to work his way into game readiness, especially having to compete against defensive end Myles Garrett on a play-in, play-out basis during practice. “It might be like coming in as a rookie, you just don’t know how really it’s going to work for you out there,” Bitonio said. “It’s definitely a different animal, and you’re on an island by yourself. Sometimes, the whole line goes that way and you’re stuck there blocking one of the best pass rushers on the team. BEREA, Ohio -- The National Football League announced Wednesday that players have been instructed to keep their heads up while making tackles and that those who lower their heads during tackle attempts will be penalized, fined and subject to ejection from competition. Cleveland Browns linebacker Christian Kirksey understands the theory and spirit of the rule, but knows that with the speed of the game, defenders will not always be able to fight against their instincts when breaking down to make a tackle. “To my understanding, you can’t duck your head when you’re making a tackle, which is going to happen,” Kirksey said prior to Wednesday’s practice. Each year, the NFL sends teams video examples of new rules in place and what plays would be considered illegal in the coming season. Kirksey confirmed to reporters that the NFL sent this year’s tape to the Browns and that he was used an example of what not to do this season for having lowered his head to make a tackle. “We all know football,” Kirksey said. “We all know the proper ways of tackling, and their sending out a message or a video to show us, ‘Okay, this is the way we want it,’ and ‘this is the way we don’t want it,’ and obviously, just in this case, they didn’t call it in a game last year, but now, they’re saying that this is improper, so I think they give us a heads up on what they really want. While cognizant of the league rules, Kirksey says that on game day, players take the field of the mindset of playing fast and physical, and does not see that changing anytime soon. “They’re looking out for our well-being, but at the same time, as a defensive player, in the back of your head, you’re like, ‘Well, if I make this tackle, [do] I have a possibility of getting kicked out of the game?’” Kirksey said. The NFL has made it a point to improve player safety in recent years, and took even more steps this offseason after Pittsburgh Steelers linebacker Ryan Shazier suffered a serious back injury in a Monday Night Football game against the Cincinnati Bengals last December that required spinal stabilization surgery and a two-plus month hospital/rehabilitation facility stay to recover. BEREA, Ohio -- Former Cleveland Cavaliers small forward LeBron James continue to inspire people in Northeast Ohio to work to better their communities, and that influence has spread to the Cleveland Browns’ locker room. 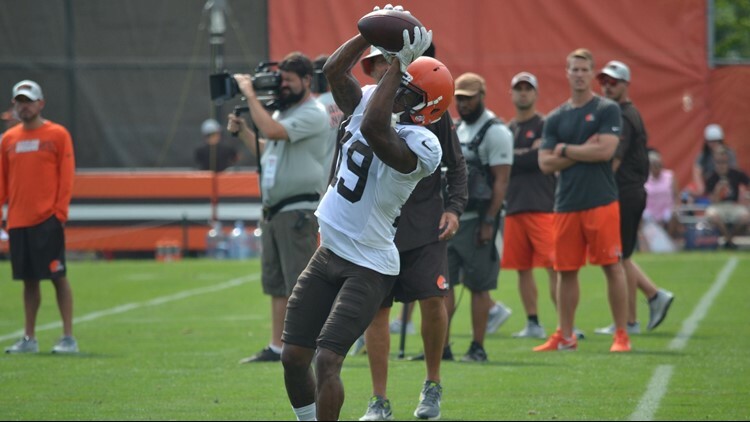 Despite being focused on preparing for the 2018 season in training camp, Browns defensive back T.J. Carrie has been paying close attention to what James did with the opening of the I Promise School in Akron, Ohio, and has been impressed by what he has seen. “I think LeBron has done an amazing job with him being here in the state of Ohio, period,” Carrie said prior to Wednesday’s practice in Berea. “I think that’s another one of the pieces that you can add to the resume on how he’s trying to give back to the community that he’s grown up in, the community that he’s been so involved in. During the 2016 season with the Oakland Raiders, Carrie established the T.J. Carrie Foundation through the Silicon Valley Community Foundation to help children “discover their greatness” through education, community programs, events and physical health. Additionally, Carrie has raised awareness for the American Heart Association through the NFL’s My Cause, My Cleats campaign. Carrie chose to represent the AHA after undergoing open-heart surgery at the age of 15 to correct a birth defect in the coronary artery between his lungs that would have made physical activity impossible if not corrected. “I think with my foundation, trying to brand what I took in in Oakland and bring it out here to give kids within the community more of an advanced learning type of system because of the opportunities that we can provide these kids, it speaks volumes,” Carrie said. Funded by the LeBron James Family Foundation and Akron City Schools, the I Promise School is more than just a place for students to get an education. There is a food pantry to help families in need and transportation services are available to make sure students get to school. By seeing what James has done in his hometown of Akron, Carrie “definitely” believes other players in the professional ranks will be inspired to help their communities. BEREA, Ohio -- Following the first day off in training camp, the Cleveland Browns have returned to work at team headquarters in Berea. The Browns will hold their sixth day of on-field work in training camp as they get ready for the 2018 season, which gets underway in just nine days in the preseason opener against the New York Giants at MetLife Stadium in East Rutherford, New Jersey. Although trusting of his players to the point where he did not give them a curfew, Browns coach Hue Jackson felt the team entered the break in a groove. “I would keep practicing to be honest with you,” Jackson said. For the latest information out of Berea and to be a part of the discussion, tweet using the hashtag, #3Browns.